The leader of the Ukrainian radical group Right Sector, Dmitry Yarosh, has reportedly demanded the country’s authorities open military arsenals for the group’s fighters. This is according to an unknown source in Ukraine’s military department, as cited by ITAR-TASS. The source also quoted Yarosh as saying the “conservative approach” of the security agencies’ chiefs doesn’t allow for order to be restored by precluding anti-Maidan rallies in eastern and southern regions of Ukraine. “Yarosh doesn’t rule out more decisive action on Ukraine, if the government doesn’t comply with these demands,” the source indicated to ITAR-TASS. However, Right Sector denounced the report as false. “It’s only an attempt to discredit out organization,” the group’s press secretary, Artyom Skoropadsky, told Slon web portal. 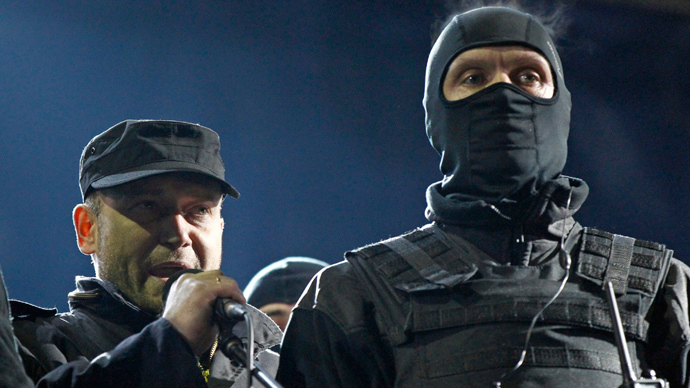 A source in the Ukrainian government has not confirmed the information on Yarosh’s demand. “I regularly see Yarosh, but it’s the first time I’ve heard about his demand to open the Defense Ministry’s arsenals,” the unnamed source told Slon. 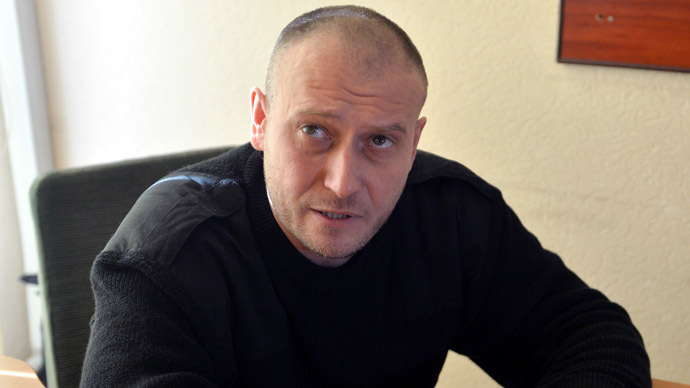 It has also emerged that Yarosh is planning to run for the presidency, according to the head of his movement in Kiev. 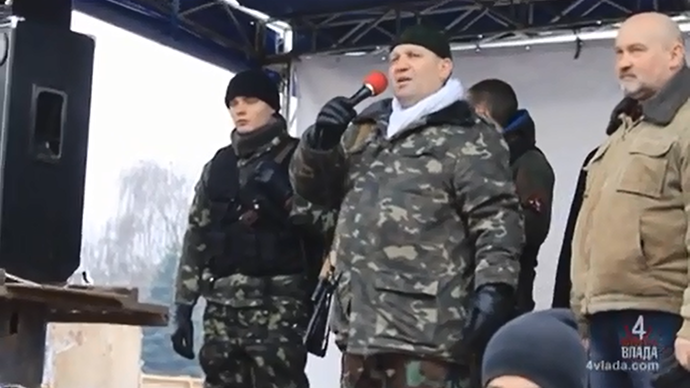 The Right Sector movement, an amalgamation of several far-right groups, was formed in November 2013. Members of the radical movement were very active in the violence which spurred the ouster of President Viktor Yanukovich. 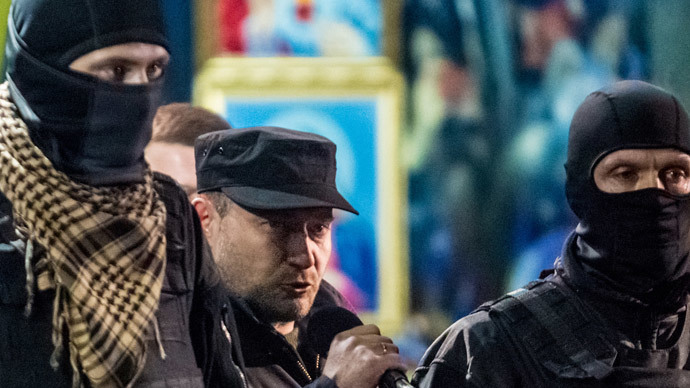 After the February 21 agreement between Yanukovich and opposition leaders was signed, the Right Sector declared they did not recognize it and would continue the armed struggle. Many of its violent acts carried out by the group have been well-documented by media and published on YouTube. The fighters used clubs, petrol bombs and firearms against the Ukrainian police. Even after the coup, some members of the movement continued to use rifles and pistols. On Wednesday, a proposal was submitted to the Ukrainian parliament suggesting that Right Sector be pronounced a regular armed unit. Coup-appointed Prime Minister Arseny Yatsenyuk dismissed three deputy defense ministers over the refusal to support the proposal. Also on Wednesday, Russia put Yarosh on an international wanted list and charged him with inciting terrorism after he urged the notorious Doku Umarov, one of the most-wanted terrorists in the world, to attack Russia over the Ukrainian conflict.